At the start of each session, the Fast ForWord program uses the student’s protocol to determine the day’s schedule and presents the exercises for that session. The student can choose any exercise to start training. The Time Spent graph tracks the minutes scheduled for the day, based on the student’s protocol (30, 40, 50, or 90 minutes). The graph fills in from left to right to show how much time the student has spent using the exercises that day. Note that time spent on this screen or on Today’s report does not count toward the protocol. Each exercise shows the current percent complete score, as a both a percentage and a bar graph that fills in left to right. The percent complete score measures exercise completion across all days, showing how much content has been mastered and how much remains. At 100%, the exercise closes and the student will not work on it again. To learn more see About completing a program. 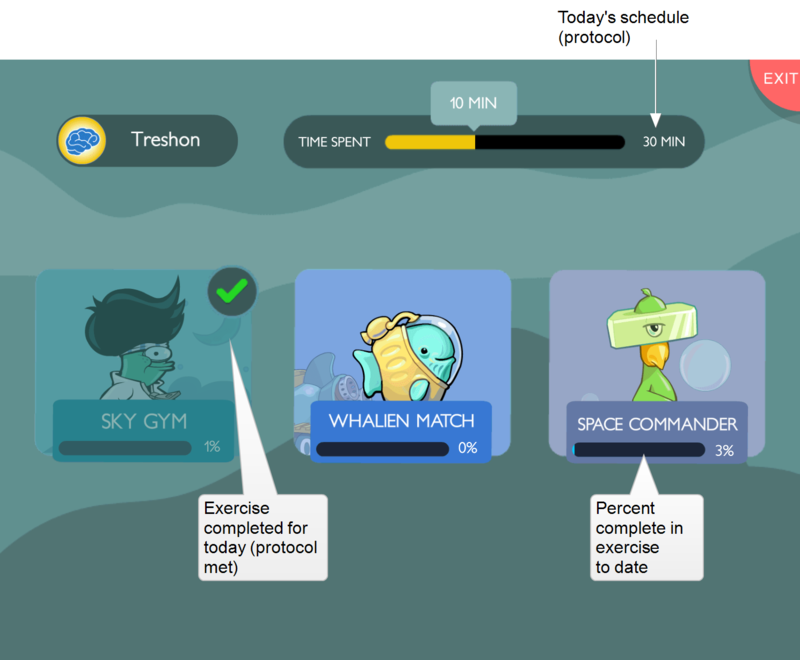 Completed exercises show a green checkmark when the student completes that exercise for the day.